The history of Déden Samten Ling, or simply Samling, is quite significant to the preservation of the Bön Buddhist tradition. Many of the sacred texts that we have today are still in existence because of the library of Samling Monastery. The main temple was established over 900 years ago by Yangton Gyalshen Rinchen in a remote and mountainous region of Dolpo, Nepal near the Tibetan border. Traditionally, this monastery, as well as others in Dolpo, has been maintained by a hereditary line of the Yangton family. Dolpo is a high-altitude, arid region located in North Western Nepal and is bordered to the North by Tibet. Even now, many areas of Dolpo are only accessible by a combination of helicopter and walking. Once the snow sets in and blocks the passes, it is best to simply wait until the snow melts before trying to make it out of the mountains. Although technically a part of Nepal, this area is culturally Tibetan and many of its inhabitants are Bönpo. It can be roughly divided into four valleys and agriculture consists mostly of barley, wheat, mustard and potatoes. For a brief time between the 15th and 16th centuries, Dolpo was an independent nation. However, this changed when the Gorkhas established the kingdom of Nepal in the late 16th century. According to a text containing the Yangton family lineage, it was some time in the 13th century that Yangton Gyaltsen Rinchen was staying near Mt. Kailash in Western Tibet when he was visited in a dream by the deified Bönpo sage, the great lama Drenpa Namkha. 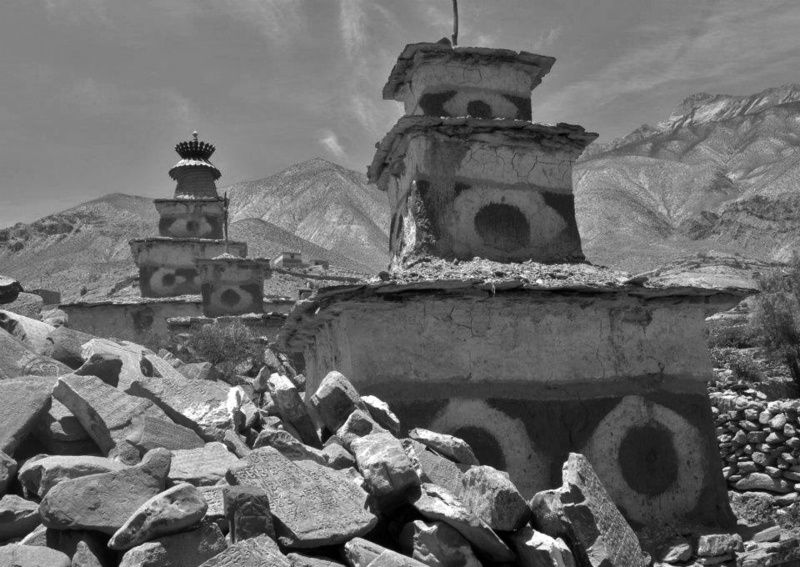 He was instructed to go to Dolpo and build a temple. Yangton Gyaltsen Rinchen traveled to Nepal soon thereafter and searched throughout Dolpo. While staying in the area of Bijer, he had a series of auspicious dreams that convinced him that he had found the proper place. Although older, Yangton Gyaltsen Rinchen was a contemporary of Drugyal Yungdrung, the lama who compiled the Zhang Zhung Nyen Gyu teachings of Dzogchen into an easy to follow practice manual. He was also the first of many Yangton lamas at Samling to be a great collector of sacred texts. Because of their appreciation and preservation of the scriptures, many volumes of texts were saved from being lost forever. It was during a trip to Samling Monastery in 1961 that Dr. David Snellgrove was to discover a copy of the Zi Ji, the story of Buddha Tönpa Shenrap’s life, from which he later published his Nine Ways of Bön. The text that he consulted for his translation was estimated to be approximately 400 years old. Posted on February 20, 2013, in Tibetan Culture & History, Uncategorized, Yungdrung Bon Monasteries and tagged Asian studies, Buddhism, Dolpo, Nepal, pilgrimage, religious texts, spirituality, Tibetan history, Tibetan Texts, yungdrung bon. Bookmark the permalink. 2 Comments.